The recent appearance of New Zealand-born screen actor Russell Crowe in the British tabloid headlines wasn’t that much of a surprise. Over the last fifteen years or so, Crowe has been a regular visitor to the UK not least to work on a number of Hollywood blockbusters including Gladiator and Robin Hood. Shooting on both of those films, and on the forthcoming Les Miserables, took place at Pinewood Film Studios west of London and Crowe, you’d imagine, would be more than familiar with the area. So much so that he should find it relatively easy to locate somewhere to wind down after a hard day’s filming. And, for the famously sports-loving Crowe, where better to relax than at one of the area’s best appointed leisure centres. Except that staff at Crowe’s chosen venue ‘rudely’ refused him entry as he wasn’t a member. Feeling somewhat miffed, Crowe resorted to Twitter, accusing the venue of having “hoity toity staff with chav accents.” Again, given Crowe’s reputation for being somewhat ‘difficult’, his attack – delivered via cyberspace – wasn’t particularly surprising either. What was surprising was that he’d travelled to the leisure centre on a combative mission. Russell Crowe wanted to play squash. Where Crowe first started to play squash isn’t a matter of public record. 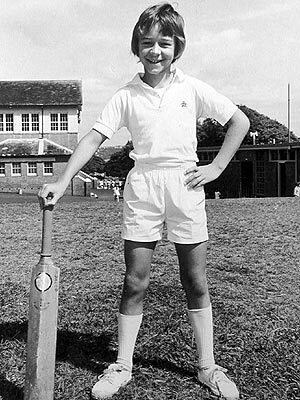 As a child, he played cricket and his cousins Martin and Jeff Crowe are both former captains of New Zealand’s ‘Black Caps’ Test side. In 2008, Crowe even captained an ‘Australian’ Team containing former Aussie Test captain Steve Waugh against an English side in a charity ‘Hollywood Ashes’ Cricket Match’. Since childhood, Crowe has also been a keen supporter of the South Sydney Rabbitohs rugby league team and, in 2006, he and Australian businessman Peter Holmes á Court bought 75% of the club, leaving 25% ownership with the members. In the US, he supports the University of Michigan Wolverines American football team and, in Canada, the Toronto Maple Leafs ice hockey team. Back in the UK, he follows English football teams Bristol City and Leeds United, both located well outside the London area. But it’s in the relatively affluent English Home Counties that Crowe’s recent sports-related combat mission took place. And, based on his experience of filming and living in the area, you’d have thought he’d be well aware of the options available to him to book a squash court. The filming of Russell Crowe’s latest film, Les Miserables, started in March 2012 in France and in a number of English locations including Winchester Cathedral Close, the naval base at Portsmouth, Oxford and Pinewood Film Studios. 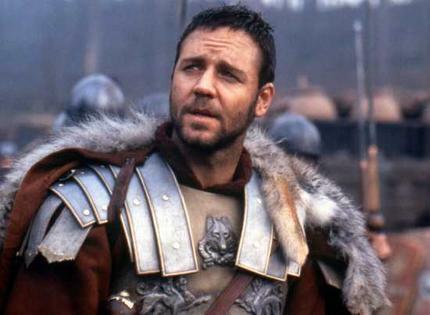 Pinewood Studios were also used in 1999 to film Gladiator, the production for which Crowe received an Oscar nomination for his performance as Roman general Maximus Decimus Meridius. The opening battle scenes for the film, set in the thickly-wooded forests of Germania, were shot in three weeks in Bourne Woods near Farnham in Surrey. When director Ridley Scott learned that the UK Forestry Commission were planning to cut down the forest, he convinced them to allow the battle scenes to be shot there so that he could burn it down as part of the filming and save them the bother. Ten years after the shoot, Scott and Crowe were back in a now rather less thickly-wooded Bourne Woods filming scenes for Robin Hood. Following that film’s release, Crowe stormed out of a BBC radio interview at the exclusive Dorchester Hotel in London after it was suggested that his accent in the film sounded Irish. But it wasn’t the first time in his life that Crowe had been involved in an altercation that would subsequently hit the headlines. In 1999, Crowe was involved in a ‘scuffle’ in a bar in Coffs Harbour, New South Wales in Australia which was caught on security video. Two men, including a Coffs Harbour nightclub owner, subsequently conspired to extort $200,000 from Crowe to keep the video secret. The matter went to court. Three months earlier, Crowe was alleged to have attacked several people in a drunken rage outside a Coffs Harbour nightclub, one of whom suffered a bite to his neck and a broken thumb. The matter did not go to court. In 2002, Crowe was alleged to have been involved in a ‘brawl’ with a businessman inside a trendy Japanese restaurant in London. The fight was broken up by a fellow actor and did not go to court. In 2005, Crowe was arrested and charged with second-degree assault by New York City police after throwing a telephone at hotel employee who had refused to help him place a call when the system didn’t work from his room. He was charged with fourth-degree criminal possession of a weapon (the telephone). The employee, a concierge, was treated for a ‘facial laceration’. All of which would seem to indicate that Russell has good eye-hand co-ordination occasionally, but not always, linked to an appearance in a court. Although not necessarily a squash court. To end on a positive note, Crowe’s squash mission did come to a successful conclusion when he gained entry to a nearby leisure centre. “A friendly spot, where regular folks hang” he later commented. All’s well that ends well, you might say. And nobody hurt. Sadly, I haven’t managed to find any images of Crowe actually playing squash. However, here he is dealing impressively with a large number of black balls flying towards him at enormous speed. And he doesn’t even have his squash racket with him. Thanks to the Daily Mirror for it’s article documenting Russell Crowe’s squash altercation. Also thanks to all at Maximum Crowe, a website dedicated to chronicling Russell’s ‘bad boy’ behaviour.